Improve your Business, Relationship, Health and achieve financial freedom, ONE BITE AT A TIME. 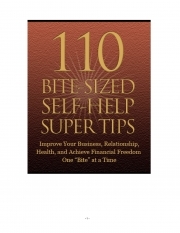 Description of "110 BITE-SIZED SELF-HELP SUPER TIPS (eBook)"
Reviews of "110 BITE-SIZED SELF-HELP SUPER TIPS (eBook)"
Its refreshing to read page with language which is 'simple, easy & straight'. After reading, one senses Innocence & honest intention to overcome day to day negativity. The points thou look simple, are at the end effective and more importantly executable. Executable because they are simple and matter of fact. Honest attempt with simple & effective points.